A small shortage will make a planet's population stop growing. A severe shortage will cause a population decline. Natives are the most vulnerable to starvation, and start dying if their planet has even a slight shortage. Since you can't make Natives and Natives are about twice as good at farming as the best farming race you can design, this is a severe loss. For non-Lithovores, improving farmers' productivity is one of the most important early-game objectives, as it helps you to grow your population and / or move a few people from farming to research. Inefficient farming can indirectly lose you a game, because (except for extreme blitzers) you need to increase your research fast in order to win. Even Lithovores need to think about food, because if they're successful they will usually conquer some planets with non-Lithovore populations. On a recently-conquered colony, some of the population will be angry and unproductive, indicated by yellow icons. If you see yellow farmers, replace them with assimilated people. If you are Feudal or Dictatorship (or their advanced versions, Confederation or Imperium) and the colony has no Marine Barracks, build one. The increase in morale will increase productivity by 20% of the base value in the table. Marine Barracks is a starting tech (no research required), so even Uncreative races can always use this. Most of these technologies have alternatives at their levels of the tech tree, so non-Creatives have to make choices. Note: the only purely agricultural tech Lithovores can research is Weather Controller - the rest don't appear on their Research Menus. Increases any planet's food production by 2, even on a Toxic / Radiated / Barren planet. For non-Creatives the alternative tech at this level is Biospheres (+2 population capacity), which most players prefer. Hydroponic Farm has 1 advantage: it is not affected by blockades (see below). Increases farmer's output by 1 food each (so not usable on no-farming planets). For non-Creatives the alternative tech at this level is Cloning Centers (+0.1 population growth per turn); that's a tough choice. Increases any planet's food production by 4, even on a Toxic / Radiated / Barren planet. For non-Creatives the alternative tech at this level is Weather Controller (see below), which most players prefer. Subterranean Farms have 1 advantage: they are not affected by blockades (see below). Increases farmer's output by 2 food each. For non-Creatives the alternative tech at this level is Subterranean Farms (see above), but most prefer Weather Controller. Ultimately it depends on the player's strategy of food production. If they have a leader that provides a massive food production bonus then all of their food production will be concentrated on a few planets in a single system. But for a player that has most of their planets self-sufficient in terms of food (avoiding the BC cost of using freighters), it doesn't make sense to have one on every planet so Subterranean Farms is better for them. Increases the output of a colony's farmers, workers and scientists by one per head. It's an expensive building. But it's the only tech at its level of the tech tree, so is always available to Uncreatives (the game designers probably included it to make sure Uncreatives get some sort of productivity boost in each occupation). And because it boosts all types of productivity, it's available to Lithovores. An achievement that increases food production by 1 per farmer, even on Toxic / Radiated / Barren planets. For non-Creatives the alternative techs at this level are Gaia Transformation and Evolutionary Mutation. But this is at the very top of the Biology tech tree, and few competitive games get this far. If you're farming, it's almost inevitable that some colonies will have a food surplus (especially if they have Natives). No-farming planets have a food shortage unless populated only by Lithovores and / or Androids (manufactured population, not a type of race). And new non-Lithovore colonies usually have a food shortage because it's more important for them to start building something (often Housing in the early game). You can use Freighters to transfer food instantly between planets. Freighters are built in fleets of 5, but they can operate individually, and each can carry 1 unit of food. You need Freighters to transfer food to a colony even if another one in the same system has a surplus. Freighters must be researched, and a freighter fleet costs 50 PP to build; freighters have no maintenance cost while inactive, but there is an operating cost of 0.5 BC per turn per individual Freighter that is actually in transit. Farming and industrial productivity is halved on all your colonies in that system, althouth research is unaffected. Movements of your freighters within, to and from the system are impossible. Note: If you share a star system with another player, and that player is at war with a third, blockading, party, you will not be blockaded unless you are also at war with the third party. Blockades often cause food shortages — in the worst case one of your "breadbasket" colonies is blockaded and you get food shortages there and at the colonies that depend on its food exports. Natives (if you have any) are the first to die of starvation - a serious permanent loss, since they are far better farmers than any race you can design. You can manage food production from the Colony List - click "Food" at the bottom to sort colonies in order of food produced. If you scroll to the bottom you see colonies that are producing little food and no food. If some of these can produce more food, you may want to increase their farming in order to free Freighters for other tasks or to reduce the cost of using Freighters. 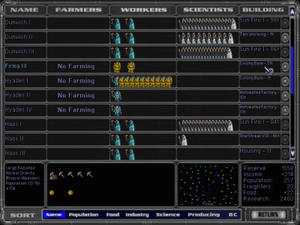 If you scroll to the top you see your largest and usually most efficient food producers. These are the colonies you will most often use to help feed other colonies. And, if you have a large food surplus, these are probably the ones where you can move farmers to other jobs. This page was last edited on 26 February 2014, at 07:13.